Available in three formats to suit a variety of steam, diesel, and electric locomotives, Econami provides high-quality 16-bit sound, Hyperlight lighting effects, and Hyperdrive2 advanced motor control for enhanced realism. New features include Flex-Map technology, an easy-to-use method for assigning any function to any function key. 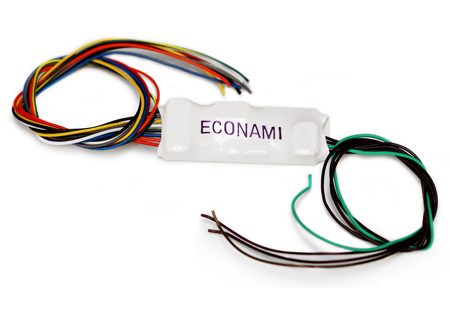 The Econami line includes our smallest sound decoder, the ECO-100, measuring just 27mm x 10.5mm x 5mm, as well as the ECO-400 4-amp version for models requiring a little more “beef.” The 21-pin ECO-21P mates nicely to any model with the NMRA-supported 21-pin socket.